A Canadian medical marijuana grower is partnering with a major European greenhouse operator to create “Europe’s largest” medical cannabis producer in Denmark, becoming the second licensed cultivator to build a facility in the Scandinavian country. 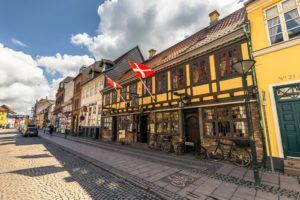 Alberta-based Aurora Cannabis and Alfred Pedersen & Son (APS) plan to form a joint venture called Aurora Nordic Cannabis A/S that will be based in Odense, Denmark’s third-largest city on the island of Funen, according to a news release. In December, Canopy Growth unveiled plans to establish a 430,000-square-foot production facility in Odense. Aurora and Canopy are traded on the Toronto Stock Exchange under the symbols ACB and WEED, respectively. Aurora said construction of a 1-million-square foot facility will be conducted in phases, with the first 200,000 square feet scheduled for completion in the third quarter of this year. Cam Battley, executive vice president of Aurora, told Marijuana Business Daily the company plans to complete the 1-million-square-foot facility by next winter. It is expected to produce 120,000 kilograms of medical marijuana annually. “This is enormous for us,” Battley said. The deal expands the company’s European footprint. Last year, Aurora Cannabis acquired Germany-based Pedanios, an importer, exporter and distributor of medical cannabis. Aurora’s Scandinavian production will be prioritized for Denmark, Sweden, Norway, Finland and Iceland, and Battley said excess production will be sold in the European Union. Aurora will own a 51% of the joint venture. APS received a license to cultivate cannabis from Lægemiddelstyrelsen, Denmark’s Medicines Agency, on Jan. 1. Financial terms of the deal were not disclosed, but the companies noted that construction will be funded through a combination of non-dilutive finance and direct investment by Aurora and APS. Marijauna was never keept illegal for what it did to you…..it was kept illegal for what it did for you….think about it. that’s their claim. Interesting, considering that their stock valuation is mostly based on potential output, as opposed to actual production. Aurora Sky, their other million sq ft greenhouse near Edmonton, has yet to actually start production as it is behind schedule. So they have no track record of being able to produce high volume cannabis. Interesting, but this seems to be a trend in the industry.